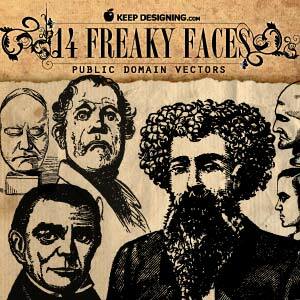 Here are some old school vector facial expressions that we’re sharing – mostly close-ups and a few profiles. Looks of surprise, stoicism, confidence, heads with no bodies and a drunken trio round out this free vector art package. As a bonus there are 4 royal ladies who look most displeased for reasons unknown. This is copyright free vector artwork that can be used for any personal or commercial use.� The download zip file contains one eps that�s functional to anyone running adobe illustrator eight or higher. Happy designing! Every day a new vector for any commercial use . . . Thank you! They are absolutely great !! Lol! These look fun. Thanks! Great Vectors. Thanks for sharing. Kind regards from Germany!